This blog has reached a milestone over the last week. Over 15,000 people have visited this blog since it was begun in Oct., 2008. Since my fellowship in Philadelphia last summer, the viewership has risen greatly, and I’ve been averaging over 1500 visitors per month with 2600 in March as my top month. I don’t know how that compares to other blogs out there, especially on such an esoteric topic as the origins and uses of the chemical elements, but it represents to me that my purposes in creating this blog are being fulfilled – people are finding out about the Elements Unearthed project and are hopefully learning about the elements (although this is impossible to assess using just the WordPress stats). I can’t track demographics about the age or interests of the visitors except by looking at the most common search terms they’re using. Some of the time the searches bring people here accidentally – for example, they might be looking up how to build a water turbine and find my post on the water turbines used at the Du Pont Gunpowder Factory in Delaware. I don’t have any instructions that would be useful for them, and their purpose wasn’t to find out about how gunpowder was made, but here they are. A rough estimate is that about two-thirds to three-fourths of the people coming to this blog are doing so because of legitimate searches involving chemistry, the elements, or the history of science or mining. I hope that I have provided the information they need. I get a few searches every day about the Tintic Mining District around Eureka, Utah. This is probably because not many other sources exist. Some of the comments written show that some of these visitors had relatives that worked there (so do I – one of my great grandfathers died as a result of injuries received as a miner in the town of Diamond, part of the Tintic District). This lets me know that I need to soon do the episodes on the Tintic District. Now that the weather is (mostly) getting better, I hope to take one final trip to the area around Mammoth, Diamond, and Silver City to complete the photos and video I’ll need. My plan this summer is to visit a mining area at least twice per month. Then, if I have a school team that wants to do that area, we’ll have much of what we need all ready to go for the 2010-2011 school year. Ultimately, it’s the videos that this site is about. If you want to play them on YouTube, you can simply look up “davidvblack channel” in the YouTube search engine and all 23 of my videos (including the Business Profile Videos and my animation demo reel) are there. This blog’s purpose is to promote the videos and talk them up, giving some background into their creation. Once I have three topics done (the next topic after beryllium will be glass blowing), I will set up a dedicated website and upload the videos to iTunes, which will provide another location in addition to their existence here on this blog and on YouTube. There are some drawbacks to this blog as the primary source of the videos: since WordPress converts the video to FLV format, these videos won’t work on an iPod, iPhone, or iPad (I went to the local Mac store recently and tried out an iPad. The videos, being Flash based, won’t play). So I need a site like iTunes that can work for the Apple crowd as well (my kind of people). Here are some stats on how the videos are doing: The episodes that have been finished so far have been the two parts of the Periodic Table featuring my interview with Dr. Eric Scerri of UCLA and the first half of the episode on beryllium. On this blog site, the periodic table videos have been played over 370 times, and on YouTube they have been played over 1100 times. This isn’t to say that they have been played all the way through; the average play is about three minutes (which is why I try to keep my Business Profile Videos to three minutes or less). They were uploaded about two months ago, so they’ve seen about 1500 plays or about 4500 minutes of viewing so far. I’m pleased with that. 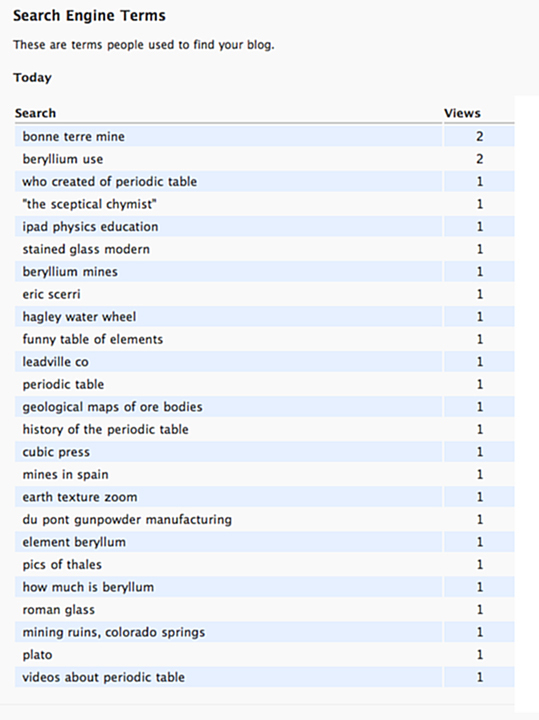 The beryllium video (which covers the uses, sources, and geology) has been viewed 82 times here and 27 times on YouTube since it was posted about two weeks ago. Considering it is a more limited topic, I feel that is a good start as well. 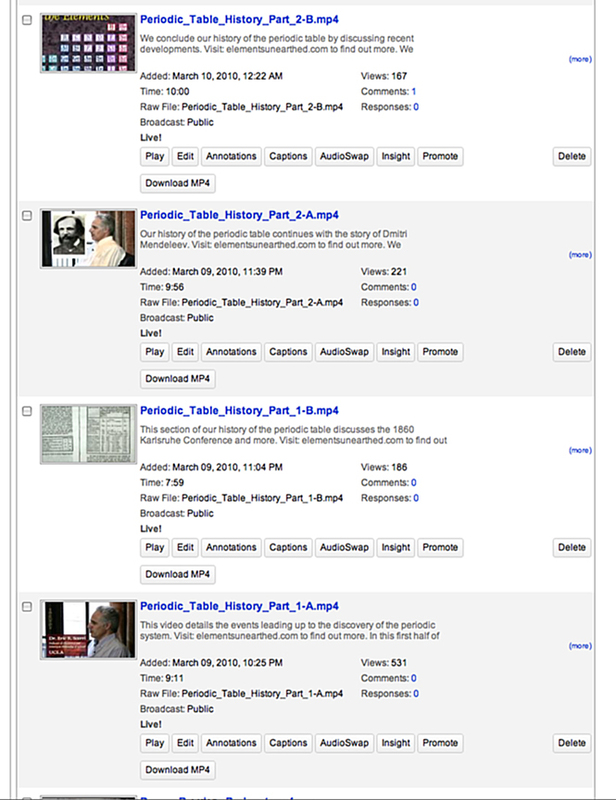 Even more surprising, to me, is that the Periodic Table videos have been close-captioned into Portuguese by Luis Brudna and have been viewed over 2200 times – twice as much as they have been viewed in English. Here is the link to the Portuguese versions: http://www.youtube.com/tabelaperiodicaorg#p/u/3/5lV6BIkAhvQ for the first of the four parts or http://www.youtube.com/tabelaperiodicaorg#g/u for the YouTube channel. The Beryllium Part 1 video has been translated on Vimeo at: http://vimeo.com/11555398. You can visit Dr. Brudna’s website at: http://www.tabelaperiodica.org. Now it might seem that I’m just into an ego trip, obsessing over these stats, seeing who is referring to this blog from their site, who is putting links to these videos on their sites, etc. It’s like typing your name into a Google search to see if you really exist (I don’t show up until something like Page 19 of the search results . . . there are a lot of other David Blacks out there). But I do have a reason for tracking how this blog and the videos are doing: I hope to be able to show the reach of this project to potential funding sources. Since NSF turned me down this year, I’ll have to go begging hat in hand from other sources, and being able to show how many people are finding and using this blog and viewing the videos will be essential for a successful pitch. If any of you out there read this, I would appreciate your writing a comment on how you’ve found this blog, what needs (if any) it has met for you, how you’re using it, etc. Any information I can get on how effective this blog is which goes beyond the bare numbers will be very useful for me. Meanwhile, I’ve been very busy with some client videos that were on a tight deadline, but I have a lull now for a few days and I’m getting back to Part 2 of the beryllium episode (this section on the history of mining, refining, and hazards). I’ll get it posted within the next week or two, give or take the weather (I’m also trying to plant a vegetable garden, if the ground will ever dry out enough). Then I’ll start on the blown glass video, which already has the narration and much of the video editing complete from my students last year. I’ve gathered more photos and need to add them. It will be done in two parts as well: one on the history and process of blowing glass, the other on the science and hazards of glass blowing. I’m shooting for mid-June to have those done, and will set up the iTunes site then. That should be enough episodes complete to start pounding the pavement looking for funding. Beryllium is the first member of the alkaline earth family of elements, which means that it’s highly reactive and easily bonds to form compounds but is difficult to separate into a pure metal. 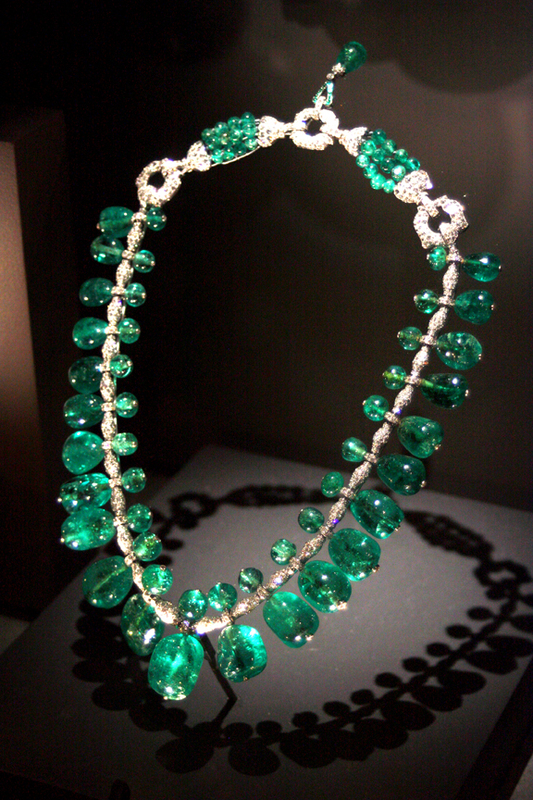 Beryllium was discovered by Louis-Nicolas Vauquelin in 1798 as a component of beryl and in emeralds. Friedrich Wöhler and Antoine Bussy independently isolated the metal in 1828 by reacting potassium with beryllium chloride. Beryllium’s chemical similarity to aluminum was probably why beryllium was missed in previous searches. 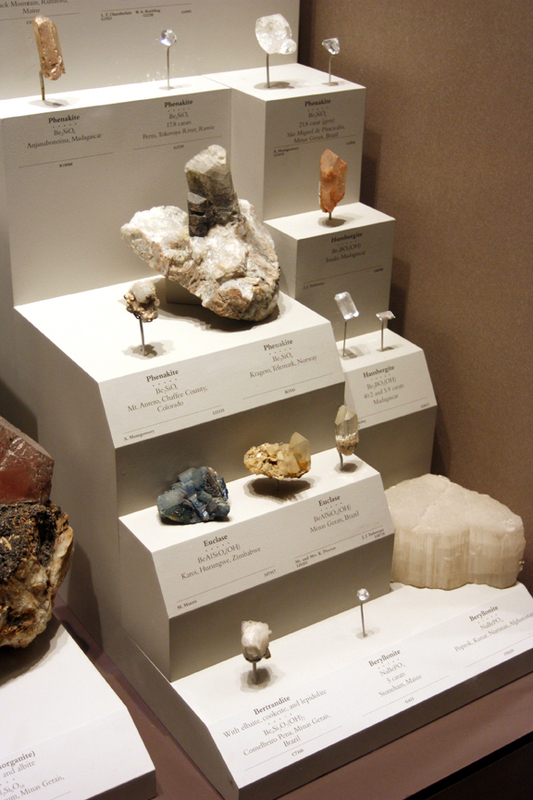 We now know that beryllium is found in only a few minerals, including the beryl family and bertrandite. Beryl is a hexagonal crystal of beryllium aluminum cyclosilicate that can have various colors depending on impurities. Trace amounts of chromium or sometimes vanadium give it a deep green color; when crystallized slowly into a transparent crystal, it is called emerald. Emeralds have been prized as gemstones for thousands of years; today, the main source of emeralds is Columbia in South America. Trace amounts of iron (II) ions produce a blue-green variety of beryl called aquamarine. Small amounts of iron (III) ions produce shades of beryl from golden yellow to greenish yellow called heliodor. Manganese (II) impurities produce pink beryl called morganite. Completely pure beryl is colorless and is called goshenite. 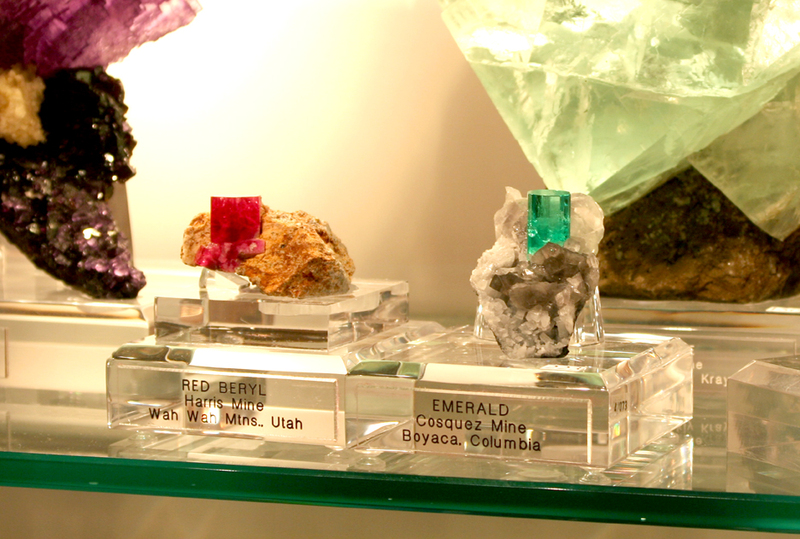 The rarest form of beryl is red beryl, mined only in the Wah Wah Mountains of southwestern Utah. It gets its color from traces of manganese (III) and is a deeper red than morganite. 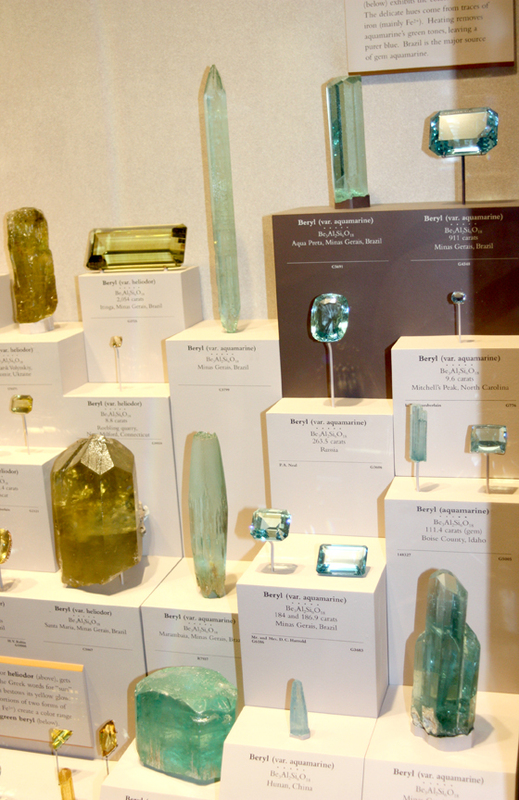 In addition to these gem varieties of beryl, there is non-gem beryl, which is opaque and considered semi-precious. It is chiefly mined in Brazil in the Minas Gerais District although some deposits exist in Colorado and New England as well; it is New Hampshire’s state mineral. A large specimen 5.5 meters by 1.2 meters was found in a quarry in Maine, and the largest crystal ever found is a beryl crystal from Madagascar that is 18 meters long and 3.5 meters in diameter. Bertrandite, on the other hand, is a pinkish mineral consisting of hydrous beryllium oxide silicate that doesn’t form very large crystals. It tends to be found clinging to grains of igneous pegmatites such as granite. 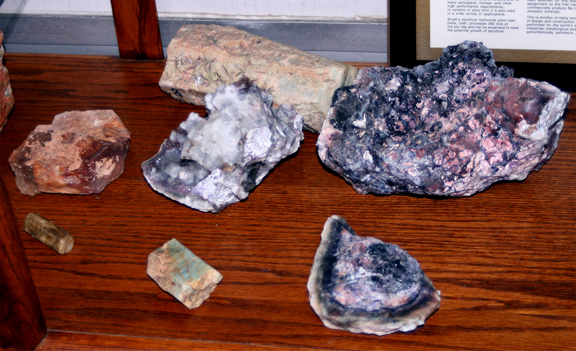 The bertrandite in the Spor Mountains of western Utah is found in highly altered rhyolite and is the only deposit large enough and concentrated enough to mine commercially. It is the sole source of beryllium for all of the United States. 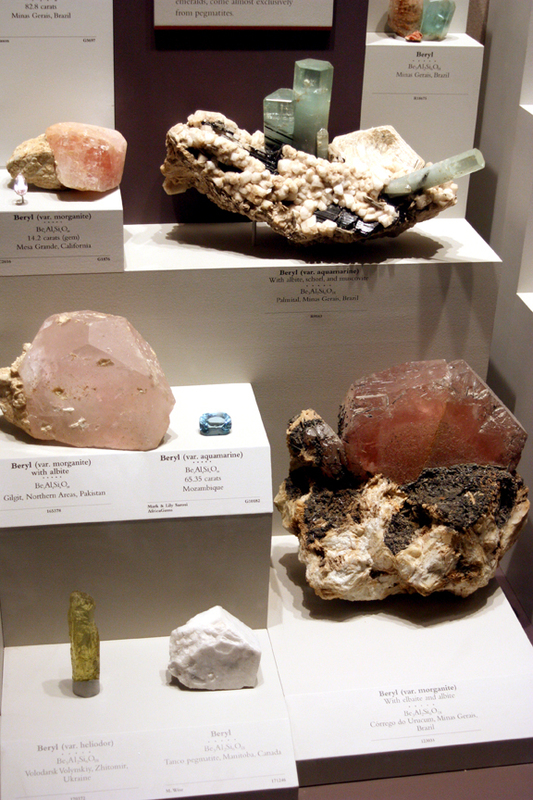 Beryllium is also found in a few other rare minerals, such as chrysoberyl (beryllium aluminum oxide), phenakite (beryllium silicate), euclase (hydrous beryllium aluminum silicate), hambergite (hydrous beryllium borate), and beryllonite (sodium beryllium phosphate).